How Do You Count Parallel Universes? Cosmologists have been thinking for years that our universe might be just one bubble amid countless bubbles floating in a formless void. And when they say "countless," they really mean it. Those universes are damned hard to count. Angels on a pin are nothing to this. There's no unambiguous way to count items in an infinite set, and that's no good, because if you can't count, you can't calculate probabilities, and if you can't calculate probabilities, you can't make empirical predictions, and if you can't make empirical predictions, you can't look anyone in the eye at scientist wine-and-cheese parties. In a Sci Am article last year, cosmologist Paul Steinhardt argued that this counting crisis, or "measure problem," is reason to doubt the theory that predicts bubble universes. Other cosmologists think they just need to learn how to count better. In April I went to a talk by Leonard Susskind (silhouetted in the photo below), who has been arguing for a decade that you don't need to count all the parallel universes, just those that are capable of affecting you. Forget the causally disconnected ones and you might have a shot at recovering your empiricist credentials. "Causal structure is, I think, all important," Susskind said. He presented a study he did last year with three other Stanford physicists, Daniel Harlow, Steve Shenker, and Douglas Stanford. I didn't follow everything he said, but I was enamored of a piece of mathematics he invoked, known as p-adic numbers. As I began to root around, I discovered that these numbers have inspired an entire subfield within fundamental physics, involving not just parallel universes but also the arrow of time, dark matter, and the possible atomic nature of space and time. Lest you think that the whole notion of parallel universes was ill-starred to begin with, cosmologists have good cause to think our universe is just one member of a big dysfunctional family. The universe we see is smooth and uniform on its largest scales, yet it hasn't been around long enough for any ordinary process to have homogenized it. It must have inherited its smoothness and uniformity from an even larger, older system, a system permeated with dark energy that drives space to expand rapidly and evens it out-the process known as cosmic inflation. Dark energy also destabilizes the system and causes universes to nucleate out like raindrops in a cloud. Voilà, our universe. Other bubbles are nucleating all the time. Each gains its own endowment of dark energy and can give rise to new bubbles-bubbles within bubbles within bubbles, an endless cosmic effervescence. Even our universe has a dab of dark energy and can birth new bubbles. The space between the baby bubbles expands, keeping them isolated from one another. A bubble has contact only with its parent. The process produces a family tree of universes. The tree is a fractal: no matter how closely you zoom in, it looks the same. In fact, the tree is a dead ringer for one of the most famous fractals of all, the Cantor set. In a simplified case, if you start with a single universe, by the Nth generation, you have 2N of them. You label each universe by a binary number giving its position in the structure. After the first bubble nucleation, you have two universes, the inside and outside of the bubble: 0 and 1. In the first generation, universe 0 spawns 00 and 10, and universe 1 spawns 01 and 11. Then, universe 00 gives birth to 000 and 100, and so it goes. The process goes on forever, approaching a continuum of universes (the red line at the top of the diagram) indexed by numbers with an infinity of bits. The fun thing is that these numbers are not standard-issue infinite-digit numbers like 1.414… (√2) or 3.1415… (π), which mathematicians call "real" numbers-the ones you find on a grade-school number line. Instead they are so-called 2-adic numbers with very different mathematical properties. In a more general setup, each universe could fork into p universes rather than just two, hence the general term p-adic. Mathematicians came up with p-adic numbers in the late 19th century as an alternative way, besides real numbers, to fill in the spaces between integers and integer fractions to make an uninterrupted block of numbers. In fact, Russian mathematician Alexander Ostrowski showed that p-adics are the only alternative to the reals. Unfortunately, mathematicians have done a good job of smothering the beauty beneath formal definitions, theorems, lemmas, and corollaries that dot every ‘i' but never tell you what they're spelling out. (My mathematician friends, too, complain that math texts are as compelling to read as software license agreements.) It wasn't until I heard Susskind's description in terms of counting parallel universes that I had a clue what p-adics were or appreciated their sheer awesomeness. What differentiates p-adics from reals is how distance is defined. For them, distance is the degree of consanguinity: two p-adics are close by virtue of having a recent common ancestor in their family tree. Numerically, if two points have a common ancestor in the Nth generation, those points are separated by a distance of 1/2N. For instance, to find a common ancestor of the numbers 000 and 111, you have to go all the way back to the root of the tree (N=0). Thus these numbers are separated by a distance of 1-the full width of the multiverse. For the numbers 000 and 110, the most recent common ancestor is the first generation (N=1), so the distance is 1/2. For 000 and 100, the distance is 1/4. To put it another way, if someone gives you two p-adic numbers, you determine the distance between them using the following procedure. Line them up, one on top of the other. Compare the rightmost bits. If they're different, stop! You're done. The distance is 1. If they're the same, shift to the left and compare the next bits over. If they're different, stop! The distance is 1/2. Keep going until you find the first bit that is different. This bit-and none other-determines the distance. This distance rule messes with your mind. Two parallel universes that look nearby can be far apart because they lie on different branches of the tree. Likewise, two points that look far apart might be nearby. In the figure at left, universe ‘B' is closer to universe ‘C' than to ‘A'. What is more, the number 100 is smaller than the number 10, since it is closer to the far left side of the multiverse. With p-adics, you gain precision by adding digits to the left side of the number rather than to the right. Accordingly, mathematician Andrew Rich and undergraduate Matthew Bauman have dubbed them "leftist numbers." p-adics can be added, subtracted, multiplied, and divided like any other self-respecting number, but their leftist proclivities change the rules and make arithmetic unexpectedly easier. To add two p-adics, you start with the most significant digit (on the right) and add them one by one toward the least significant digits (on the left). With reals, on the other hand, you start with the least significant digit, and you're out of luck if you have a number such as π with an infinite number of digits. The weirdness doesn't stop there. Consider three p-adic numbers. You can think of them as the three corners of a triangle. Oddly, at least two sides of the triangle must have the same length; p-adics, unlike reals, don't give you the liberty to make the sides all different. The reason is evident from the tree diagram: there is only one path from one number to the other two numbers, hence at most two common ancestors, hence at most two different lengths. In the jargon, p-adics are "ultrametric." On top of that, distance is always finite. There are no p-adic infinitesimals, or infinitely small distances, such as the dx and dy you see in high-school calculus. In the argot, p-adics are "non-Archimedean." Mathematicians had to cook up a whole new type of calculus for them. 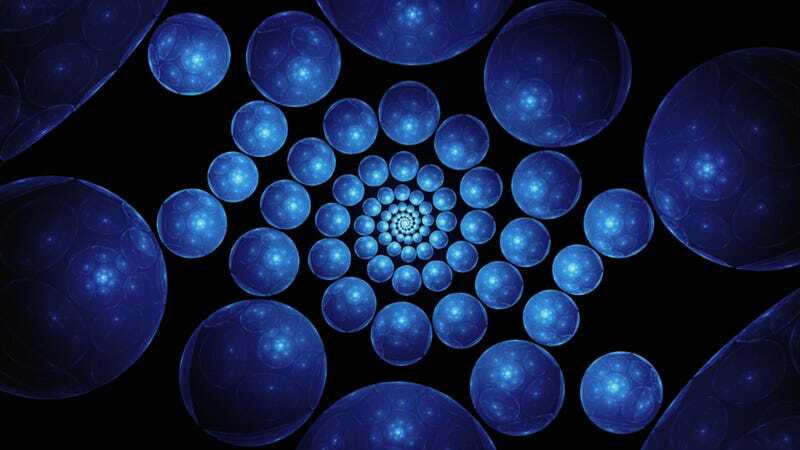 Prior to the multiverse study, non-Archimedeanness was the main reason physicists had taken the trouble to decipher those mathematics textbooks. Theorists think that the natural world, too, has no infinitely small distances; there is some minimal possible distance, the Planck scale, below which gravity is so intense that it renders the entire notion of space meaningless. Grappling with this granularity has always vexed theorists. Real numbers can be subdivided all the way down to geometric points of zero size, so they are ill-suited to describing a granular space; attempting to use them for this purpose tends to spoil the symmetries on which modern physics is based. By rewriting their equations using p-adics instead, theorists think they can capture the granularity in a consistent way, as Igor Volovich of the Steklov Mathematical Institute in Moscow argued in 1987. The resulting dynamics might even explain dark matter and the mechanics of cosmic inflation. Naturally, having found a new toy to play with, physicists immediately wonder how to break it. Susskind and his colleagues took the tree of parallel universes, lopped off some of its branches, and figured out how it would deform the p-adics. Those pruned branches represented infertile baby universes: those born with zero dark energy or a negative density of the stuff. Just as pruning a real tree might seem destructive but actually helps it to grow, pruning the tree of universes mucks up its symmetry but does so in a good cause: it explains, the team argued, why time is unidirectional-why the past is different from the future. p-adics are a case study of how a concept mathematicians invented for its own beauty might turn out to have something to do with the real world. What a bonus that they may be more real than the reals. This post by George Musser originally appeared at Scientific American. Musser is a contributing editor at Scientific American. He focuses on space science and fundamental physics, ranging from particles to planets to parallel universes. He is the author of The Complete Idiot's Guide to String Theory. Musser has won numerous awards in his career, including the 2011 American Institute of Physics's Science Writing Award. Follow on Twitter @gmusser. Top image via Shutterstock; Photograph courtesy of Gary Smaby. Bubble figure courtesy of George Musser. Tree figures courtesy of Daniel Harlow, Stanford University.